Spanish bullfighting is called corrida de toros (literally "running of bulls") or tauromaquia (the art of bullfighting). The corrida is highly ritualised, with three distinct stages or tercios ("thirds"). Each tercio is announced by a bugle sound. The ceremony starts with the paseillo where all the participants enter the arena in a parade. They include three matadores (killer of bulls), two picadores (lancers on horseback) and three banderilleros (who throw short spears into the bull's neck). Collectively called toreros (bullfighters), they salute the presiding dignitary and the public, accompanied by band music. The real show begins as the bull enters the ring. In the first stage (tercio de varas) the matador first confronts the bull with the capote, a large cape that is pinkish-mauve on one side and yellow on the other side. performing a series of passes and observing the behavior and quirks of the bull. Then, a picador enters the arena on horseback armed with a vara (lance). At this point, the picador stabs just behind the morrillo, a mound of muscle on the fighting bull's neck, weakening the neck muscles and leading to the animal's first loss of blood. In the second stage (tercio de banderillas), the three banderilleros each attempt to plant two banderillas, sharp barbed sticks into the bull's shoulders. These anger and invigorate, but further weaken, the bull who has been tired by his attacks on the horse and the damage he has taken from the lance. In the third and final stage (tercio de muerte), the matador re-enters the ring alone with a small red cape (muleta) and a sword. The matador uses his cape to attract the bull in a series of passes in order to wear the animal down for the kill and also to produce a beautiful display or faena. 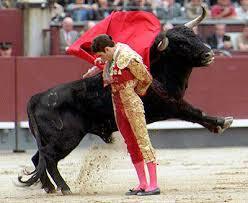 The corrida ends with the matador thrusting his sword into the bull's heart and killing it.